These costume design techniques are based on ideas from David McKay of Seattle. Dave has since died of AIDS, but his spirit lives on in all of us he inspired. The antlers are thin paper mache shells you build over real antlers. You then take the shells off the real antlers and mount the shells to a support. When finished, the rack stays on your head by a slim wire “halo” that goes under your hair. Two important aspects are weight and fit. The antlers should be as light as possible. A real deer has his antlers firmly anchored to his skull, and neck muscles adapted to deal with the weight. The realism of costume antlers is based on creating that same illusion. Even if there were a way to attach heavier antlers, they would flop around from the added mass. Light antlers means they will move crisply when you turn your head, like a real deer’s. For deer antlers on a human head, “six point” (three tips on each antler) are about all you can easily manage. Smaller “four point” antlers (two tips on each) are actually the best fit. Larger antlers may look impressive for ceremonial purposes, but if you move around with them much, you will continually be hitting door frames and tree branches. I have been surprised that many Wiccans, who are interested in the antlers for ceremonial use, don’t seem to care about this final touch of realism. 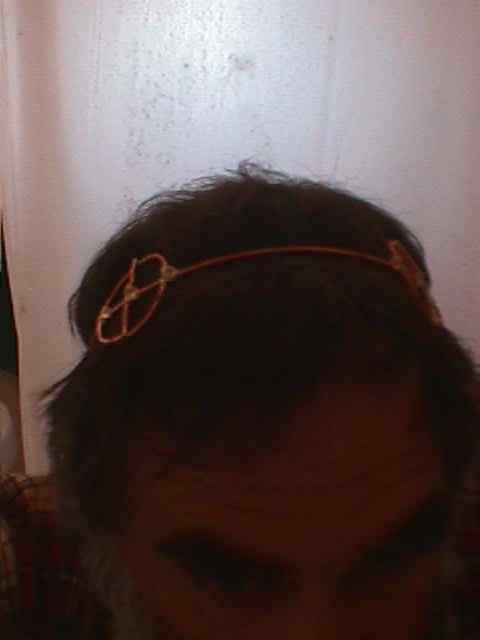 They wear the wire halo over their hair, rather than under it. If you prefer the symbolic aspect of the antlers to realism you can ignore the details of hiding the wire. You could even make it look more like a crown. You can also skimp on finishing the antler bases. However, in these instructions, I’ll describe how to make the antlers, and their fit, as realistic as possible. 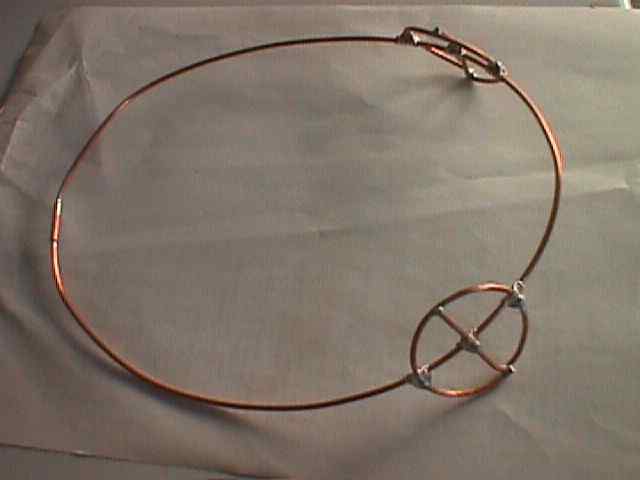 The wire halo is the foundation of the antlers. To make the finished rack fit well, pay attention to placing and sizing the halo. It should be tilted back, something like a skullcap. It should slightly “hook” under the curve of bone most people have at the back of their skull. On top, it should pass a few inches in front of the crown of your head. 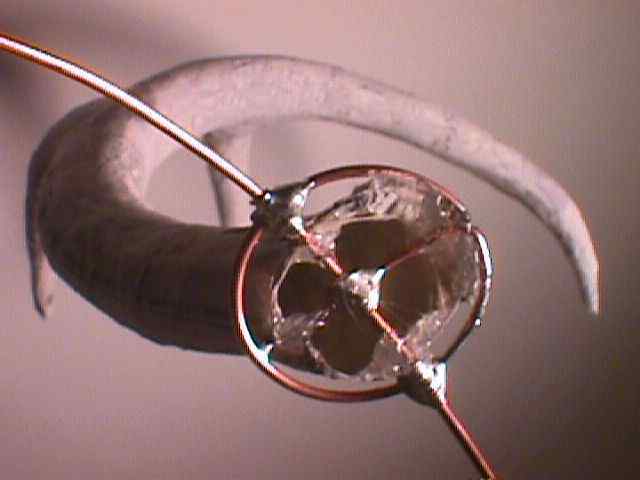 The easiest material to use is number twelve copper wire, as used in home electical wiring. Use solid wire, not stranded wire. 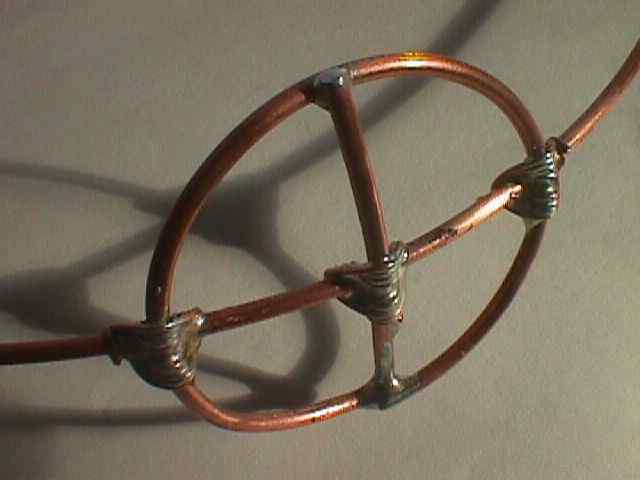 Copper has the right amount of flexibility to adjust to head contours, and it can be soldered to fit the antler bases. You will need 3-4 feet of wire total, with the longest continuous piece about 2 feet or a little more. You can buy this kind of wire by the foot at most hardware stores. Take the insulation off. You can do this most easily by stripping a small amount off one end so the bare copper shows, clamping this stripped end in a vise or vise grips, and then pulling the insulation off the other end. Fit and size the wire loop on your head. After cutting it to length, you need to join the ends to make a ring. You will want the finished junction small and smooth, so as not to snag any hair or poke your scalp. The joint must also be very strong. You don’t want your rack falling off in the midst of the action. The best way I came up with to join the wire is with a small copper tube. Much like assembling copper water pipe, you slip the wire ends into the tube and solder. Hardware stores have tubes like this in the metal stock section. Tubing 1/8 inch in diameter is the best size to fit around number twelve wire. Cut a section of the tube using a pipe cutter. A pipe cutter prevents mashing the tube or making any burrs. A piece of tube 1 inch long is sufficient. You may need to flare the cut tube ends slightly afterwards to allow the wire end to go in. You can make a slight dent in the middle of one side of the tube to serve as a stop for the wire ends, to make sure each end is halfway in. Slip the wire ends in and solder. In the finished “halo”, the least obtrusive place for the join is in back. Costume antlers fit differently on a human head than a deer’s. To make the appearance most realistic, you have to do some things artificial. The top of a deer’s skull where the antlers attach is relatively flat. By contrast, the position on your head where antlers look most believable is above the temples. This is on the slopes of the round domed part of your skull. The antlers must be held here as sturdy and stable as possible in order to move (or rather not move or wiggle) realistically. To provide good solid “roots”, you can make small rings of wire and join them to the main “halo” ring. 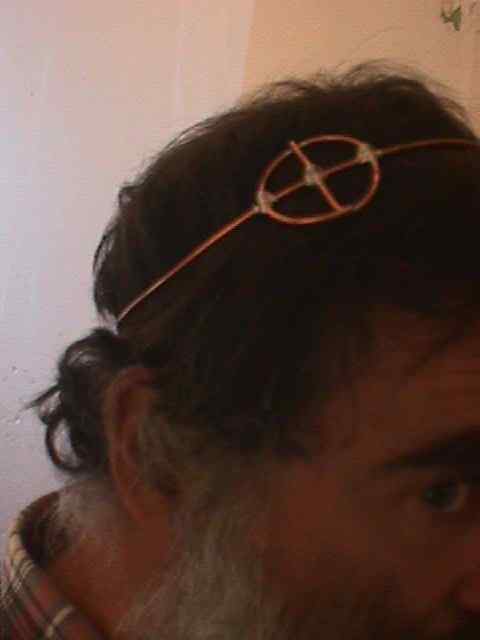 Make the rings out of the same number twelve copper wire as the halo. An inch and a half diameter is a good size for the rings. This fits the base of most average antlers. To make each root ring, curve the wire into a circle. Use some additional wire length to make a crossbar. To get the fit and placement right, you can lash the rings onto the halo with fine copper wire, such as from telephone cable. Then, you can move and adjust the rings before soldering them solidly in place. This fine wire would be from the type of phone cable that has four color-coded wires and is used for wiring phone lines that are left permanently in place, not the kind of cord that goes from the phone jack to the phone set. This latter type has wires that are too thin and the insulation is very hard to take off. The kind of cable for permenent wiring has solid wires. You can usually buy it by the foot. Pull the insulation off the same as for the main halo wire. Lash the root rings onto the halo with the ring cross bars x-ing across the halo wire at right angles. This way, there will be three junction points for maximum rigidity. With the root rings lashed on, the rings are fairly stable on the halo wire, but you can turn them to adjust the angle against your head. Once you have them fitted right so they lie flat against your scalp, take the halo off carefully so as to maintain the shape. Now solder the rings permanently in place on the halo wire. 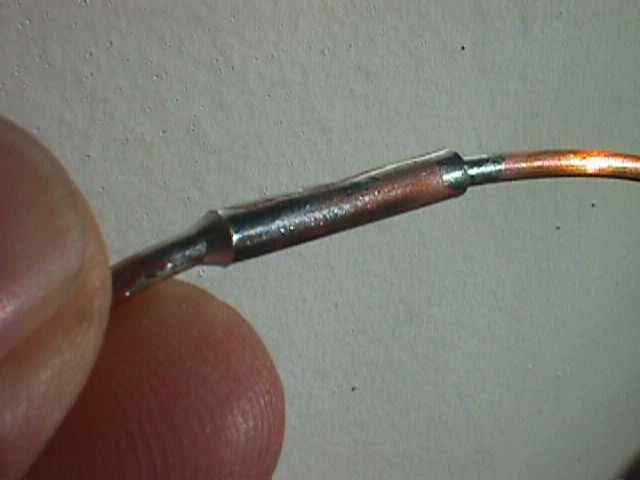 The solder will wick into the small wire lashings and lock the root rings in position. Ring attached and soldered. Notice thin wire lashings. You can be working on the antlers themselves at the same time. The antlers take multiple steps, building up the paper mache. You can build the wire halo framework in between these steps. The antler shells will be very thin, only three or four layers of paper altogether. 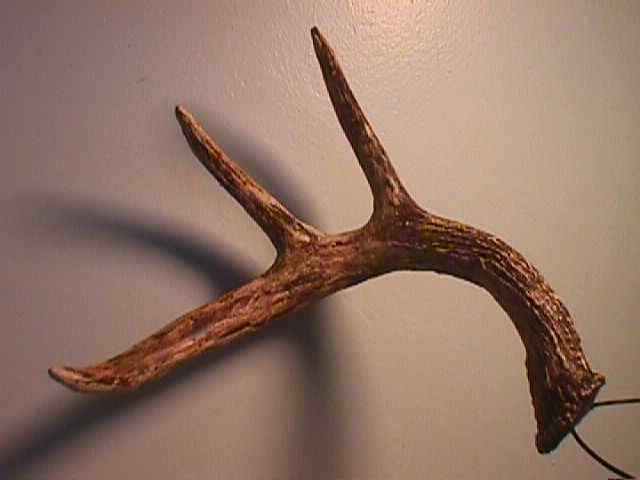 The antler shape itself, the tubular structure, provides most of the integrity. As you will see later, surface texturing steps will add additional material and strength. One of the tricks with paper mache is getting it free of the template afterwards. Paper mache is much like glue. If you were to apply it directly to the real antlers you are using as a pattern, it would be very difficult to get off once it dried. Get a roll of half inch wide masking tape. Wrap the real antlers you are using for a pattern with the masking tape, except turned backwards with the sticky side out. Wrap the antlers completely and tightly. You can crumple the edges where they turn tight corners such as in the angles and on the tips. Try to get it as smooth as possible. In this and the following stages you will build up layers on the antlers. This will add to the overall “size” of the antler structure and would ultimately make the branches thick, blunt, and less realistic. However care and attention will keep this to a minimum. Now, you can apply the first layer of paper dry, without any paste at all. Just press strips of torn newspaper onto the sticky side of the masking tape. There will be lots of loose and ragged ends, but that’s OK. The next layer, and all those after, are just basic paper mache. You take newspaper and tear it into strips a quarter to a half inch wide. Dip each strip into a paste of flour and water, wipe off the excess, and apply. When you have a layer built up, let it dry before the next. If there are large ridges or bumps, you can smooth them off with sandpaper before applying the next layer. After you have one layer of paper mache built up over the paper strips you pressed onto the masking tape, take the paper mache shell off the antlers you are using for a pattern. Carefully slit the shell along the “edges” and work it off. The backside of the masking tape should have kept the shell from sticking to the antlers very much. Only where some flour/water may have seeped in is there likely to be much sticking. The next layer of paper strips will “repair” the splits. You may find it easier to do this in stages. For example, lay on a few strips of paper mache in strategic places to hold the cut sides together. Don’t worry about making a complete layer yet. After the strategic strips dry, you can fill in the rest of the layer, covering the rest of the splits. You may need only one more layer. The basic structure of the antlers will be quite strong just by its shape. You are probably not going to be doing actual combat with this rack, so the tips only need to hold their shape. The bases will be reinforced as you join them to the wire halo. On a deer’s head, antlers attach at something like a right angle to the skull. The most realistic position on a human skull has the bases coming in on quite a narrow slope. Study how antlers “ride” on a living buck. They swoop sort of out and back, then the points splay forward and up. 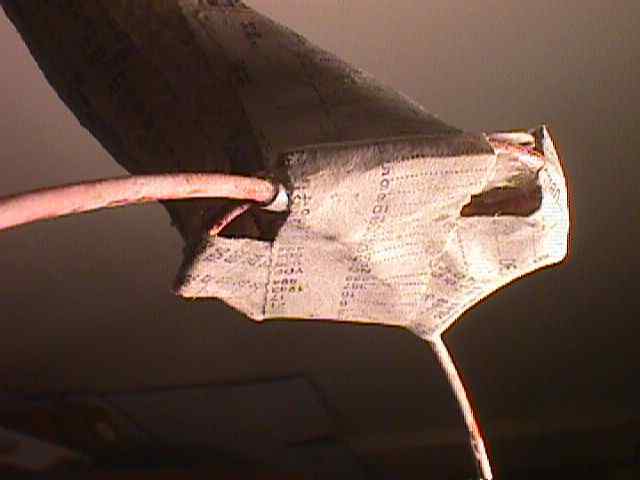 To get a believable simulation on your own head, turn your paper mache antlers shells till they give a similar effect. Now trim the tubular bases of the antler shells so they meet as flush as possible to the root rings on the mounting halo. You will end up cutting them at an angle. If you were to try putting them on straight, the antlers would stick out in a very unrealistic way. Attach the antler bases to the mounting halo using a hot glue gun. This is the easiest way to make the initial junction. You need to connect the pieces to check angle and fit. 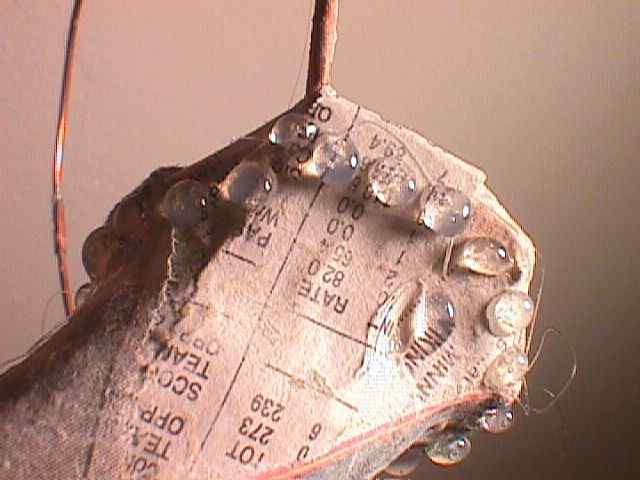 A few dabs of hot glue will be good enough to hold, but fairly easy to take off if you need to adjust. Once you have things together in the right shape, you can reinforce the connection. Now is the time to adjust how the rack will “ride”, and how it will look on your head. If you don’t like the fit at this point, take the antlers off the support halo and adjust. You may even decide to rebuild the support halo for different angles and fit. Do that before you invest any more effort in the set’s final finish. Once you are satisfied with the overall shape, reinforce the juncture of the antlers and the support. Attach the antler shells to the root rings with more strips of paper mache. You may have to do this in stages, letting things dry in between. At first, just crisscross a few strips, down one side of an antler base, across the bottom of a root ring, and up the other side of the antler base. You don’t need to get it perfect as texture finishing later will hide minor flaws. At this point, the paper mache antlers should have a realistic overall shape, but the surface texture and color is still just newspaper. Study the real antlers you used as a form. If they are old shed antlers, weathered and gray, you might not see all these features I am about to describe. 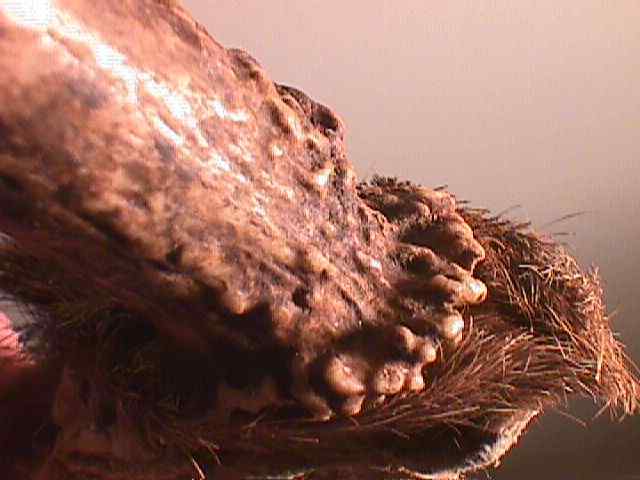 The bony structure of antlers is not smooth surfaced except at the tips. Especially at the base, it is very irregular with small rounded protrusions and lumps. Further out along the antler shafts, these lumps flow out more into ridges and lines. This texture has been lost in creating the paper mache shells. 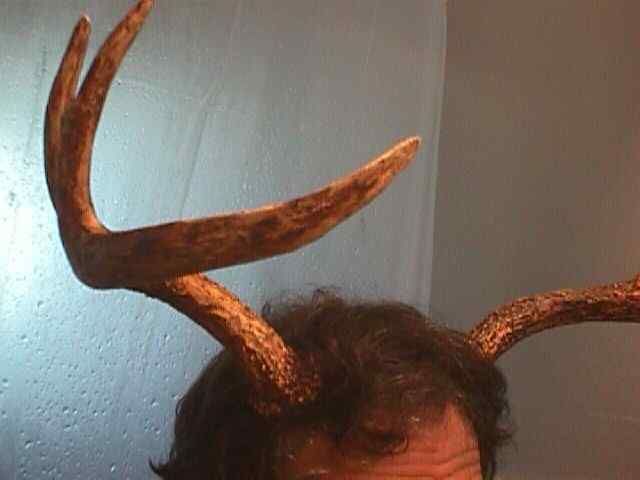 To make your costume antlers realististic, you need to recreate it. After the texture, you will re-create the color. First make sure the outer parts of the paper mache shells are fairly smooth. Edges and seams that run along the branches will not be so noticable. However, folds and corners that break the smooth flow of the antler structure will be a giveaway. Strips of paper mache that spiral around and around the antler branches look especially artificial. You can take off corners using sandpaper, and fill in hollows with hot glue. The most critical areas that need to be smooth for realism are the outer few inches of the antler tips. 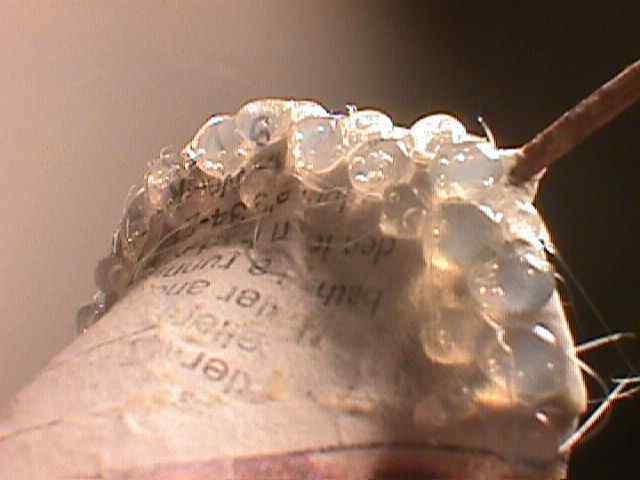 You can even build them up with hot glue if you wish, to compensate for the “blunting” caused by adding layers of paper. 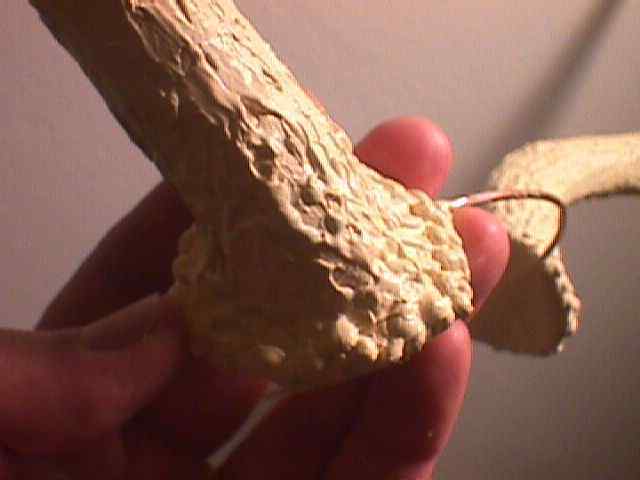 You can simulate the lumpy texture of the antler shafts and bases with hot glue. Apply drops of hot glue at the very bases of the antlers. Keep these drops separate from each other. You will notice the glue stays soft for a few minutes, and in this time it will tend to spread out, flattening any height the drops have. Drops that touch will tend to flow together, losing the lumpy shape you are aiming for. Let one set of drops cool completely before adding more, or they will just become one smooth layer. You may want to put on three or four distinct sets of drops. Further out the antler shafts, you also want a somewhat lumpy texture, but with the lumps running more into lines and ridges. Finally, at the antler tips, the texture should be quite smooth. Next, turn your attention to simulating the color antlers show while worn on a buck’s head. Antlers have an inner bony layer that is pale yellowish or ivory (old weathered antlers become whitish or gray). When antlers grow each summer, they are covered with dark brown skin and “velvet”. As they mature, the dark layer dries up and the deer rubs it off. 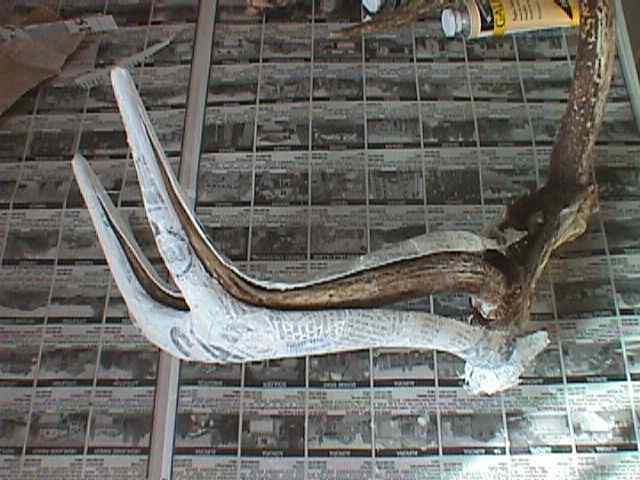 In the autumn, then, on antlers that are still attached, the pale color is evident at the antler tips and at certain wear marks the buck polishes most. 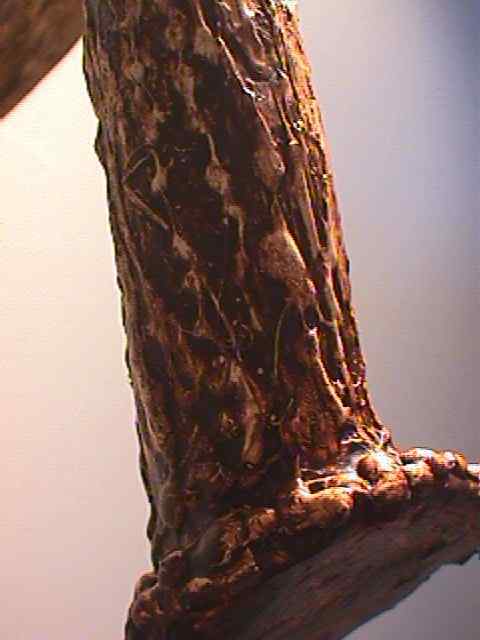 The dark color remains at the antler bases, on the “back sides” away from wear marks, and in the “cracks” between the lumpy texture features. 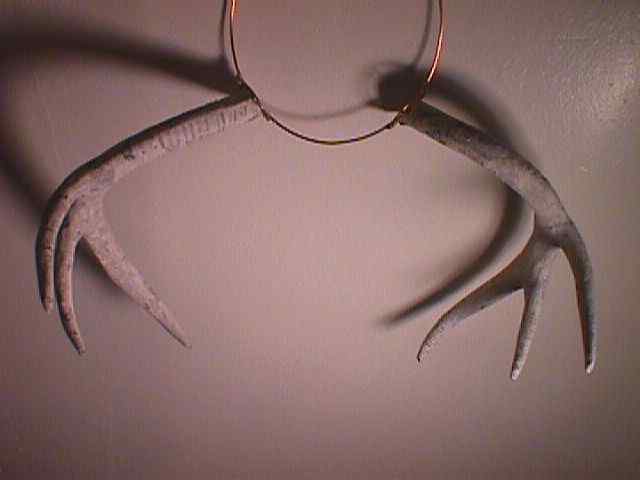 In real antlers, the lighter color shows where the darker color has worn off. In costume antlers, you can simulate this by first painting them all over a light color. After that dries, you can apply the dark color in a thin layer, and wipe parts of it off while still wet. The best type of paint to use is artist’s acrylic. You will need tubes of four colors: black, white, a light yellow such as Naples Yellow, and a dark brown such as Burnt Umber. The black you will need only to paint the halo wire after you are done, to make it less visible under hair. Mix the yellow with white to create the light “ivory” base color. 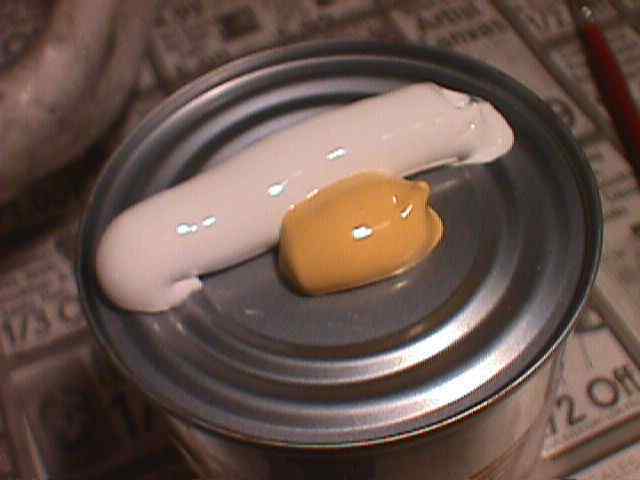 You can mix it quite pale, in a ratio of about four or five white to one yellow. Paint the antlers all over this color. You will notice the thick acrylic paint fills in any tiny cracks, such as at the edges of blobs of hot glue. Let the ivory layer dry. Once dry, acrylic paint will not dissolve again when it gets wet, as from more layers added on top. Thin some of the dark brown color with water so it has about the consistency of cream. Paint it quickly over the ivory layer. Then, when it is partially dry, work it with a piece of wet sponge. Wipe away most of the brown layer in areas a buck naturally rubs off his velvet. 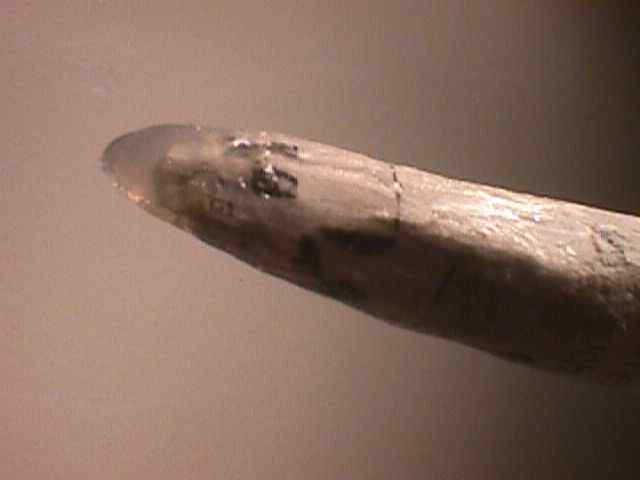 These are the antler tips, and certain (mostly forward facing) wear marks. Also, lightly work the tops of the lumps at the antler bases and along the shafts. This simulates the general wearoff when a buck sheds his velvet. You can take as much care as you wish to make the texture realistic, considering the distance and angle people will see your costume antlers from. As shown above, the texture does not have to be exactly like real antler in order to be quite believable. When the brown paint layer dries it will be permanent, even if it has been thinned down with water. This dual nature of of acrylic paint is a great advantage. You can use it thick like oil paint for an opaque layer, or thinned with water for degrees of transparency like watercolor. The final construction step is to paint the halo wire black so it will not show as much when worn under hair. Putting the antlers on is easier with an assistant. Place the halo on your head. Then, all around the upper edge of the wire, have your helper catch your hair with a comb and bring it out from under the wire. Brush this hair down over the wire. This both hides the wire and holds it in place. If your hair is an inch or more long, it should hide the wire completely, giving the illusion the antlers are rooted to your skull.